This spring is not only a time for responding to the return of fresh colors in the landscape, it is time for me to try something new. I am beginning to blog about one aspect of my work, listening to what the trees say, what they have to offer in a visual conversation, and then creating artwork that expresses the energetic dialogue. The collage above includes snippets from my past work – clicking on it will make a bigger collage. Eventually I’ll have a clickable set so all can be seen individually. While I painted streetscapes as one part of my work in the late 70’s and the 80’s, I have spent most of my time in the last 25 years focused on wilder landscape, primarily the Adirondacks. 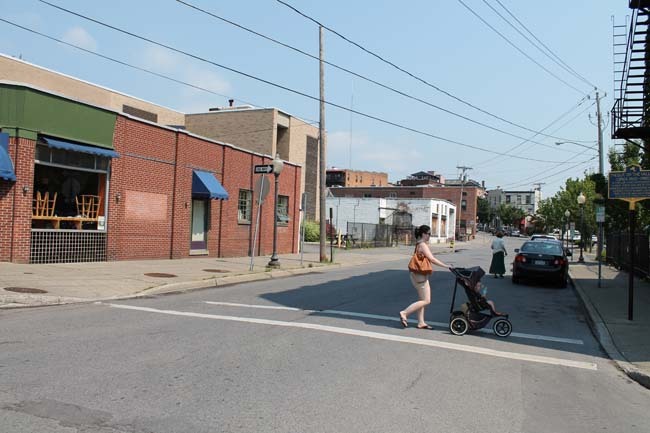 My renewed interest in the Saratoga Springs landscape, and specifically in the trees, was sparked last fall by a workshop about the city’s trees. In a program at the library, Tom Denny of Sustainable Saratoga presented information about The Urban Forestry Project (UFP). We walked around downtown in small groups and discussed the trees that we saw, how they fit into the landscape, and where additional trees might go. 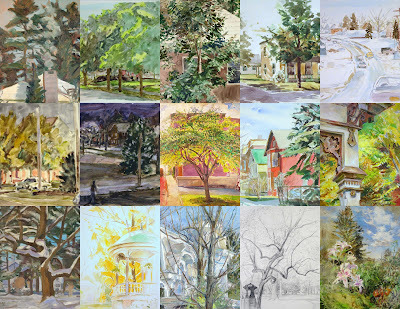 I started thinking about engaging the landscape of Saratoga Springs in a way that would inspire a new direction for my work as well as add to the ongoing conversation about the role of trees in Saratoga Springs. Before starting my own work, I produced some Photoshop images to be used by the UFP, with barren streets transformed into tree-lined passageways. 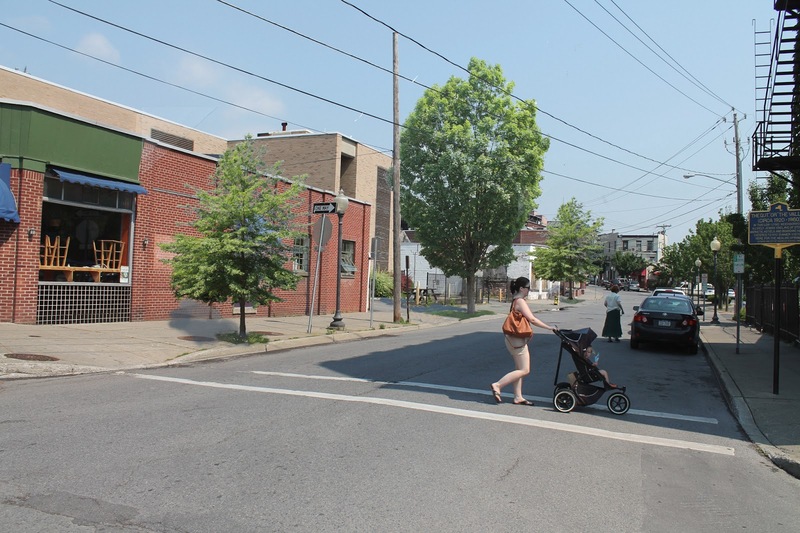 Here is the corner of Phila and Putnam Street, with the ideal urban forest below. To get started on new work, I did some sketches in January from the warmth of my car, but didn’t start a larger painting until April with the return of warm weather. More on those in days to come. Meanwhile I have pulled together older works (see the snippets in the collage) and have been thinking about what has changed and what has stayed the same in my work as well as which trees are no longer in the landscape. So over the next months, leading up to an exhibition at the Spring Street Gallery that will run from mid- September to mid-November, I will be blogging about both older works and the works being created for the exhibition. The public will be invited to comment, to watch me at work and to display small works at the gallery on specified themes related to the trees of Saratoga. The details concerning the “assignment wall” are still being worked out. The role of a tree in a painting is very similar to the role of a tree in the actual landscape. It provides a relief from the geometry of the city streets, introduces other colors and textures and provides dramatic plays of light within its forms and its cast shadow. The exhibition will include images of trees in all seasons and in a wide range of mediums and sizes. Some trees become characters that dominate the scene while others merge into rhythmical relationships with buildings and architectural details. through variations in the compositions, some trees become bridges to the sky while others connect to the ground. The possibilities are endless – there is the challenge as well as the opportunity. At www.diggory.com/cd there is a link to Saratoga Landscapes as well as a chronology of my work up to 2002. This entry was posted in What the Trees Say on April 29, 2013 by adiggory.